March’s Rent vs. Buy Report continued to show a stronger rent position in most Tri-Cities county housing markets. The exceptions are in the three Southwest Va. counties and in Hawkins County where the position is neutral. The report calculates median buying costs based on Realtor.com county-level residential price data and median rental prices sourced from the U.S. Department of Housing and Development data for rental estimates in the 50th percentiles. Household income data is from Nielsen Pop-Facts Demographics. According to the report, it was cheaper to rent in 7 of the 11-counties in the Tri-Cities region last month. The strongest rent position was in Johnson County where it was 18% cheaper to rent than buying. 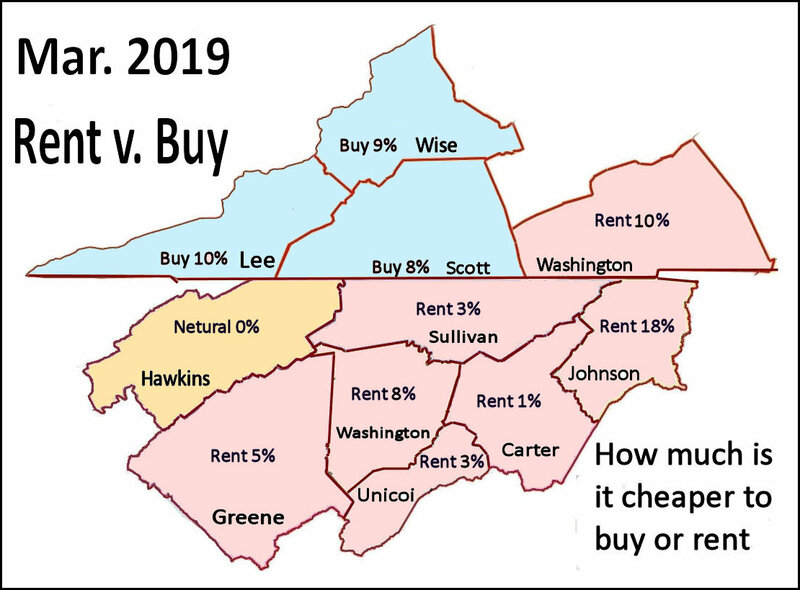 The weakest rental position was in Carter County where it was 1% cheaper to rent than buying. The report compares the median monthly costs of renting and buying relative to median income in 3,143 U.S. counties. By March 2019, renting costs have gone up in 66% of the counties, and buying is cheaper in 40% of counties nationwide.